Claire Dederer is a freelance writer who has written book reviews and essays for Salon, Vogue, the New York Times, Yoga Journal and The Nation. She also contributed to the anthology Heavy Rotation: Twenty Writers on the Albums that Changed Their Lives, edited by Peter Terzian and Money Changes Everything, edited by Elissa Schappell and Jenny Offill. 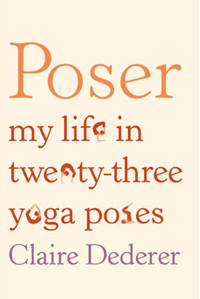 Dederer's memoir, Poser: My Life in Twenty-three Yoga Poses, is scheduled for release in early 2011. In it, Dederer looks at how yoga has changed her life in unexpected ways, leading her to question basic assumptions about what it means to be a good mother, daughter, friend and wife. "Poser is unlike any other book about yoga you will read—because it is actually a book about life. Witty and heartfelt, sharp and irreverent, Poser is for anyone who has ever tried to stand on their head while keeping both feet on the ground." Claire Dederer lives on Bainbridge Island and is married to Bruce Barcott.